With the weather being so inclement and even our own homes being blown and washed away we can appreciate that it must be confusing and bewildering for the wildlife out there. I have a clapped out nest/rest box attached to a down pipe and I know a robin has been sheltering in there recently, so I now have a little vigil going to see if they will actually nest there, fingers crossed. In a feeder designed for a square brick of suet/fat I have stuffed in some nesting material – the inside of an old pillow, some shredded paper and the like. I have already replaced the stuff twice! Today was a lovely day and inspired many of us to look forward to Spring – it will arrive – we will just have to get past this low pressure and bad weather bouts for now. 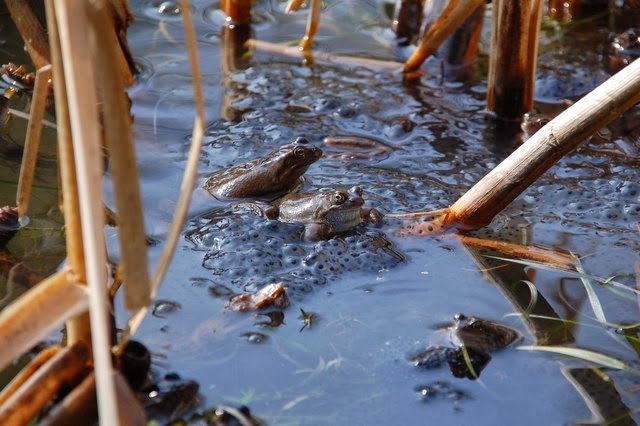 The first sighting of frog spawn was spotted up the country during the week and a common newt was spotted in Leinster also. This shows no matter how severe the weather that nature will cope and carry on. These stats are to be found on the IWT.ie website on the homepage or you can enter your own sightings into biology.ie. I noticed the last day in the building I work in that there was a large bumble bee fizzing about on one of the warm spells just before the last storm, and the odd bluebottle is making an appearance too. Nice photo opportunities of feeding birds can be got on the mudflats and estuaries nearing sunset especially when the tide is out. You may have seen in the news recently the appearance of the black ibis on our shores. The Glossy Ibis was spotted by a keen bird watcher in Cork (IWT main branch Facebook page) this is a rare visitor to our shores. So it’s time to wrap up and get out the binoculars and discover the next rare visitor to our local shores.